We proudly present FlatGenie.com, a website developed for the New Media Practices project. It’s tough to get to know a new city. As students ourselves, we have experienced this first hand. This section provides neighborhood information designed for students and young expats. The concept behind FlatGenie.com was born out of a need for reliable information in the housing market, particularly for students and young people. 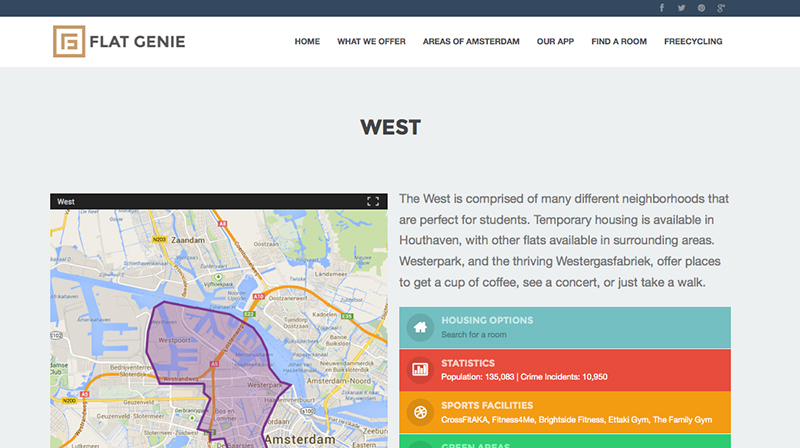 The site provides accurate information on Amsterdam’s neighborhoods, including interactive maps, official statistical information, and personalized descriptions. Two mock-ups were also designed for the project, one fully clickable app designed in Adobe Fireworks and a second created in Photoshop. Both of these mock-ups are in development for future release.